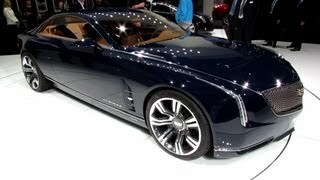 Cadillac has revealed the Elmiraj Concept, a grand coupe expressing the pure enjoyment of driving and exploring new dimensions, at Pebble Beach. The two-door grand coupe is a pure expression of streamlined design. 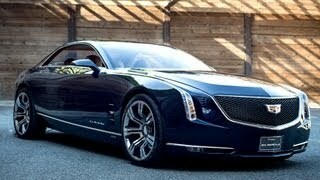 It has a long dash-to-axle front profile, a Cadillac signature, a long wheelbase and clean body side. Cadillac’s vertical light signature is represented in both the headlamp graphic and tail lamp. Elmiraj has 22-x-9-in. aluminum wheels are backed by large ceramic brakes with Cadillac monoblock calipers. The interior of 2013 Cadillac Elmiraj Concept blends elegantly crafted luxury and generous space with driver-focused performance elements. The upper section of the instrument panel is a single piece extending across the full width of the car, while the lower forms a cockpit space tailored for performance. The Elmiraj Concept is powered by a 4.5-liter twin turbocharged V8 engine delivering an estimated 500 horsepower. The engine takes the baseline technology from the new Cadillac Twin Turbo V6 featured in the upcoming 420-hp 2014 CTS Vsport edition, and expands it to the classic performance format of a V8 engine.